I cannot agree more that we need to build a bridge between blogging sphere and real world out there. And we need to stay united at the real world out there. So, your advice on utilising the already established support groups is a great place to start. Blogging for the ME/CFS Awareness united us together and reminded us that we could do something. Coincidently, I was going to do something little locally this year. And this post reminded me that I better start doing something now. I would like to say thank you again for your great idea and efforts for great cause. It hasn’t been easy since I know how little energy and time you can spend. I also want to congratulate on great achievement. 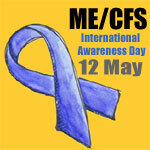 Your badge is now the face of ME/CFS Awareness at many places. And you taught us that we can still do something when things look impossible. I also notice pwME/CFS became friends from participating the event.